My first agency, Fortune Advertising had its office in a 3-storey building located at Raffles Place, right in the heart of the business district. It occupied the top two floors of a building designed in an Arabic architectural style. Except for the big boss’ room the rest of the office was not air conditioned and the afternoon temperature would soar to 100 degrees Fahrenheit – a real sweatshop. The big boss, a local businessman, was as mean as he looked – his face with his upturned eyebrows resembled that of the warlord in a Chinese opera. Right from the very first day I did not get on well with him as he wanted me to call him ‘Sir’ and as we had just come out of the colonial rule I was not prepared to be subservient to him and settled for ‘Mister’. As a trainee I was given a miserable allowance of $60 per month, which was just enough to pay for my daily lunch. If I had taken a job as a clerk I would be pay 3 times as much – at $200 a month. Still I was determined to become an adman and went through the sacrifice. The first day was of work was rather memorable. The first assignment was to sort out the printing blocks, which were in a mess (printing blocks were raised mental images which were mounted on wooden bases from which advertisements after inking were reproduced on the newspaper rolls – editor). I had to hand proof these rather dirty blocks and file them neatly. My immediate boss, George was an expatriate Art Director and I took up the challenge so that I could learn the ropes from him. Next he wanted me to saw pieces of hard boards for the filing cabinets. As I used to build model aircraft as a hobby when I was a student I was a skilful handyman and it was not a problem for me. Once I completed all the tasks given to me, this expatriate creative man realized that I was serious in learning the trade and started to teach me the art of advertising. At the same time I started my part-time course in advertising attending evening classes three times a week at the Singapore Polytechnic. As the fees were quite high, my immediate boss, George suggested that I asked the agency to sponsor my tertiary education. My big bad boss on receiving my application asked me to detail how I spend the meager $60 he was paying me. Despite my doing this, he turned me down. I do not believe he had any intention of sponsoring me in the first place. All he wanted was to exploit me as cheap labour. I subsequently learned that when one of the artists resigned, the mean boss asked him to return the year-end bonus, which he had paid out earlier. This poor guy had already spent it so he had to pay it back in installments over a period of months. Truly a boss from hell! After almost a year with this first agency, I had learned a fair bit about advertising but although my original intention was to be in the creative side of the business, I was seduced to join the account management, Art Director, George stated to bring me along to meetings and exposed me to clients. I enjoyed the challenge of servicing them, clients such as Cathay Organization and the developer of Namly Estate very much. At the same time I was attending the certificate course in advertising at the newly formed Singapore Polytechnics. As it did not have its own building at that time, I had to travel all the way to Tanjong Katong to attend the classes and this meant leaving the office promptly at 5 pm to catch the bus for the half hour journey. One of my lecturers, John was the creative head of another local agency. His subject was Design and Presentation and felt that I had a particular flair for this so when I mentioned I wanted to leave my current employer, he promptly offered me the job as an account executive. When I submitted my resignation to my ‘boss from hell’ he suddenly understood that he was under paying me and offered to triple my salary. It gave me satisfaction to turned him down as he had kept me on probation all this time. The new agency had its drawbacks. The new ‘boss from heaven’ John was not the top dog and had to report to owner who headed the agency. I soon discovered that the agency was rife with nepotism. A brother and an uncle worked in the production and finance department and they abused this position by taking a cut of petty cash claims made by the other staff. Nobody dared to complain, as they were relative of the big boss. John who supervised me was an ex-Australian bomber pilot and looked like a mafia Godfather and sported a beer belly. He revealed to me that he had a problem in judging heights when landing his aircraft. One day after belly flopping a large bomber on the runaway he ended his career in the air force. He was a nice man and gave me the opportunity to learn and progress – truly a boss from heaven. Unfortunately he had one weakness – he enjoyed going to the races at the Singapore Turf Club. One Wednesday afternoon he called to send some layouts for a presentation later in the day. However as I was so busy servicing some clients I forgot to send the materials he needed. To this day I feel bad about letting him down. 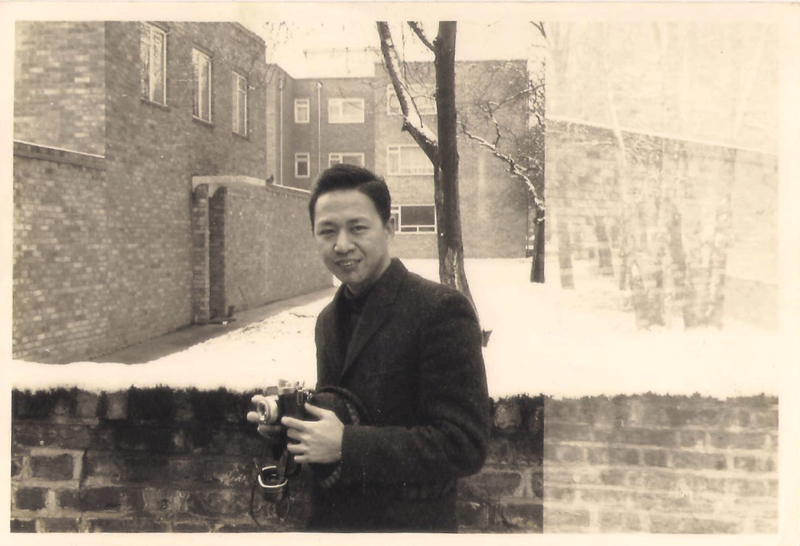 Eddie Chan in London (1964).